The eSmoke brand has earned THREE STARS. We DO NOT RECOMMEND it. We had a positive first experience with the eSmoke website. It was user friendly, easy to navigate and well-organized. The graphics were easy to read and the web designers must have known that this facilitates an inclination to make a purchase. A number of key features are highlighted on the website. Among these are the toll-free phone number, the opportunity for live chat, their money back guarantee and a lifetime guarantee on all batteries and chargers. Rarely have appearances been more deceiving. When we clicked on the button advertising the $49.95 price tag, we arrived at the eSmoke Sensation Starter Kit page. There were three kits on display. As it turned out, the eSmoke Advanced Starter Kit was not available at the same price advertised on the Home page. Initially, this kit appears to cost $49.95. On the actual purchase page, however, the listed price is $99.95. We had not read the fine print on the Home page which disassociated the pictured kit from the low price. Apparently, you can only buy the eSmoke Express Starter Kit for that price. It comes with one lithium-ion cigarette style battery, a USB charger, a carrying case shaped like a cigarette box and two cartridge atomizers. There is no choice of flavors or Nicotine levels with the last two items. You get one Tobacco flavor and one Menthol flavor at the same Nicotine strength. We chose to buy the Express Starter Kit since it contained the minimum essentials that we needed to write a review. After clicking the button beneath the $49.95 price tag our purchase was interrupted by a pop-up banner. It encouraged us to buy the eSmoke Basic Starter Kit for an additional $25.00. We clicked on the button marked No Thanks and finished the purchase process. The USPS delivered out Express Starter Kit just a few days later. After unpacking the contents of the kit we attached the Tobacco Medium cartridge to the surprisingly short battery and took a few drags on it. The LED tip glowed a satisfying red but this was accompanied by an unfortunate series of crackling and popping noises that we have heard with other lesser brands. We also noted that it took an inordinate amount of strength to draw on the e-cig. When we exhaled, a disappointing and insufficient volume of vapor appeared. One of the reviewers compared the flavor to sucking on the sleeve of an old man’s coat. The association seemed strange but we could not deny the validity of the judgment after each of us had taken several more drags. We left the battery charging and intended to try it all over again with a full strength battery the following day. Unfortunately, even with a fully charged battery, the eSmoke failed to impress. The crackling noises continued to annoy; the drags took too much effort; vapor volume was insufficient and the taste was as upsetting as ever. The Menthol cartridge atomizer outperformed the Tobacco cartridge in two crucial areas. The vapor volume was much more significant and it had an appreciable flavor of Menthol. Given this disparity between the cartridges, it seems like eSmoke Menthol may be pleasing to some smoking consumers. When we included the purchase of the eSmoke Express Starter Kit, we determined that the cost of a single-pack-per-day habit would total $560.25 per year. This works out to a daily cost of just $1.53. When viewed from a purely financial perspective, the eSmoke presents a good value in the long-term. Real tobacco cigarettes inflict a $6.00 per day cost on smokers. This comes out to an astronomically high $2,190. An eSmoke user could save more than $1,600 every year. 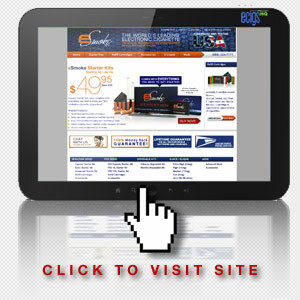 Click on the eSmoke Website link below. Enter 10PCT in the box for the Coupon Code at the checkout page to receive a 10% discount on your purchase.